Mar. 10, 2017 5:42 p.m. When John Kapusty’s tenant left, he hopped right on the chance to tap into a trending marketplace with a new business. Highway 97 is the latest brewery to open in Penticton. “I have made beer for years and we have been craft beer drinkers for a long time. 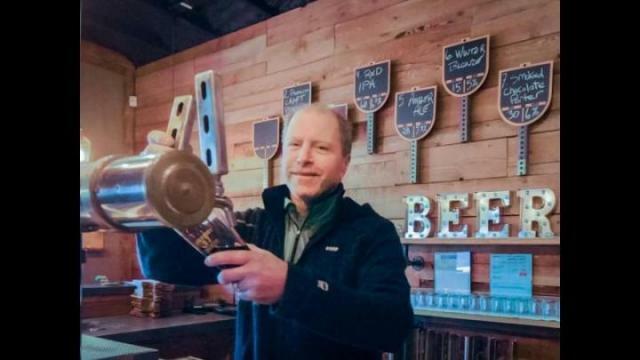 We own this building and when Tin Whistle Brewing moved to a new location, we thought maybe this is a sign it is time to finally open one ourselves,” said Kapusty, who also owns ECM Promotions in Penticton, and runs the brewery with his family. Andrew Anker is the brewer, a fully certified brewmaster, who previously worked at Vancouver craft brewery Steamworks and another start up brewery in Ontario. Stepping up to the serving station you will find an easy drinking pilsner, an amber ale that has been popular up at the Gunbarrel Saloon at Apex, a red IPA that seemed to be the favourite during their opening last weekend, a winter blonde that is lighter and spiced and a smoked chocolate porter. A scotch ale and ESB will be on tap soon and that is just the tip of the iceberg said the owner. All of the beers are made with B.C. hops, including some from Naramata and Chilliwack, and Western Canadian malted grains. Kapusty said the choices give a variety to someone who is new to the craft beer scene and to those who have tastebuds for more complex flavours. It is why craft beer continues to grow and expand in the province, across the country and the world said Kapusty. Highway 97 joins a growing number of craft breweries already in the South Okanagan including Bad Tattoo Brewing, Tin Whistle Brewing Co, Cannery Brewing and Barley Mill Pub in Penticton. Detonate Brewing Company recently opened in Summerland and in Oliver there is Firehall Brewery. Part of the allure, is the story behind the beers, those who work in the industry and knowing the source of the ingredients — just like the foodie culture. “Craft beer has amazing flavours, amazing variety and no two beers taste the same. Craft beer drinkers and people who are looking to get into craft beers are looking for a little bit of an adventure and I think that is what craft breweries do. They provide a little bit of adventure,” said Kapusty. The small-batch brewery is at the point where they have refined their recipes to have product heading out to bars and restaurants. They are also packaging bottles and cans for the government liquor stores and cold beer and wine stores. Highway 97 will also be at the upcoming Okanagan Fest of Ale on April 7 and 8. The brewery, located at 954 Eckhardt Ave. W., is open Wednesday to Sunday.